This semester has certainly crept up on me. I had a very busy winter break. The realization that this semester has crept up on me has me realizing a few other things, things that have gotten away from me. One such thing that has gotten away from me is keeping the syllabi on this blog up to date. As longtime readers of this blog probably know, my mission here is to share what I’m doing in the classroom as well as what I am thinking about as it relates to teaching and learning social media and related fields. While my primary means of doing that is via blog posts, from the start I also set out to share syllabi. Yet, as we turned the page to 2019 I realized I have neglected to share syllabi from anything after 2017, sans my 2018 persuasion and message design syllabus. Eek! One reason for this was because sometimes, on the surface that is a syllabus, not a lot has changed from year to year. The main changes tend to be ‘under the hood’ – that is, in the day-to-day class and related assignments. Yet, when I add up the changes that occur from semester to semester, it is clear that over a few years, a lot changes on my syllabi. I’ve also noted that many of you download the syllabi I share on SlideShare. For example, the social media syllabus from my fall 2016 class has been downloaded 65 times to date. So, I have updated the syllabi menu of this blog to include my 2019 spring research class syllabus, my 2019 spring campaigns class syllabus, my 2019 writing across platforms syllabus, and my fall 2018 social media class syllabus. I also placed the fall 2018 persuasion and message design syllabus in the syllabus menu. You can access the syllabus menu at the top of this page (see image below). You can also see them below. To download any of them, click the LinedIn icon. This will take you to the full page on Slideshare. There, you will see a download button. I feel good. Everything is in equilibrium. We’re all up to date… for now. Be sure to check back in 2 weeks for my “What’s Changing?” blog post, a long-running series on this blog where I start the semester by sharing changes, updates, and new approaches I am taking to my classes for the semester. Can’t wait? 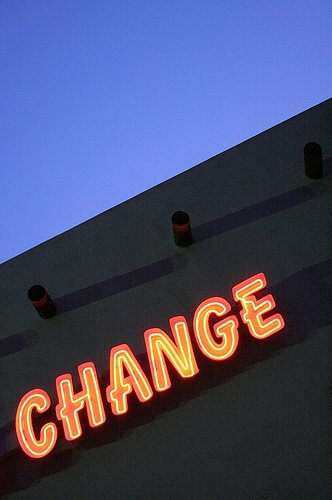 Read last semester’s “What’s Changing?” post. This post is long overdue (I feel like I say that a lot!). It is a follow up to a post I published in January titled “Here’s my communication research class assignment on analyzing media placement.” Recently, I received a public comment on that post from a professor I greatly admire, Kelli Burns, pointing out that project assignment (see the bottom of this post for that document) notes at the bottom of the document that additional work will be assigned the following day. But, I never discuss what that entails in the blog post. I apologize to everyone who read that post because, in that sense, it was incomplete in terms of explaining the project. Thank you to Dr. Burns for bringing this to my attention. With this in mind, I’ve decided to do a much-delayed follow up post, turning that initial post into a two-part series. So, if you haven’t read the first post in this series, I encourage you to go back and do so. If you just want to know about teaching students to do data entry from coded data and to create data legends, then read on my friend! In review, in the first post I provide an assignment where students download a data set of media articles using the Meltwater social intelligence software. Their task is to conduct a quantitative content analysis using a coding sheet (which I’ve provided in that first post). They are then told to do all of the coding at home, dividing up the articles to code as evenly as possible among their team. On the second day of class, students come back with the coding sheet coded for the number of articles they needed to code. I instruct the students to download the coding sheet, copy it onto a new page in their document for the total number of articles they need to code and code them by highlighting the answers on the coding sheet. For example, a student who needed to code 30 articles would return with a digital copy of an MS Word document with 30 pages, each page containing a completed coding sheet. As you probably remember learning in a quantitative methods class some years ago (let’s not age ourselves), the numbers in a data set don’t mean anything themselves. We, the researchers, assign meaning to them. This is an idea that we have to teach the students. … and so forth until we have an exhaustive list. They don’t know what variable 1 corresponds to on their coding sheet (in this example, eye color). They don’t know what a mode of 3 represents (that the most common eye color is hazel). Oh, and keep in mind that the students haven’t done any data entry yet. They don’t have their data into a spreadsheet format yet that can be imported into SPSS. So, there’s another problem. Most students have never entered data into a spreadsheet before. Get their coded data into a spreadsheet format that can be analyzed in SPSS. In my class, students need to know the four common types of measurement – nominal, ordinal, interval and ratio – , as the Netflix assignment (and other assignments to follow) use them. Students in our major are not required to take any statistics class and thus this is new information to the vast majority of them. If your students know this, you can skip it. If you need a refresher on these, here is a quick summary that explains each measurement type and its strengths and limitations. I teach them these concepts with a lecture and in-class activity to test their application. I do this earlier int he semester before we get into the Netflix assignment. This part is pretty simple. As a reminder, the students are working in teams on this project. So the team needs to create a shared Google spreadsheet in which they enter all their coded data from their coding sheets. They just need to open Word and open the shared Google spreadsheet and enter the corresponding numbers from the coding sheet in Word for each article coded. The key thing is that in this spreadsheet the columns are the questions (i.e., variables) on the coding sheet and the rows are the individual articles (such as in the image below). Otherwise, it won’t import into SPSS correctly (Note: You can import a CSV file through SPSS. So, I have my students download the Google Spreadsheet in CSV format and import that into SPSS). But, before they can enter their data they need a data legend. So..
A data legend lets the researcher quickly put meaning to the variables and numbers in their results. Creating a data legend can be done in SPSS. But, for time purposes and because students wont always be using SPSS, I prefer to do it another way. It is quite useful as I can have the data legend right in front of me on a piece of paper. Simply, have your students type or write up their data legend and keep it handy. Each variable needs a descriptive label that’s under 13 characters (13 characters is the max that SPSS allows you to use in describing a variable). eyecolor (1) brown, (2) blue, (3) hazel, (4) green. In the above, I have given the variable for eyecolor the label eyecolor. The numbers in parentheses represent the numerical value that I have assigned to the possible responses. For scale questions, the number equals the number on the scale. Example: On a scale of 1-7 where 1 means not at all, and 7 means very much so, how much do you like string cheese? stringcheese (1) not at all, (2) 2, (3), 3, (4), 4, (5), 5, (6), 6, (7) very much so. Assign each variable a label (max 13 letters). So, “schoolstatus”, “favicecream” and “rankicecream” work. With each label, make a list that indicates what # we have assigned to each term within our measurement, by placing the # in parentheses. Of course, there are some caveats when dealing different measurement types, such as ordinal data. Indeed, ordinal data and ‘check all that apply’ questions are tough. These can be a bit frustrating when doing data entry. That’s why I’ve provided below a handout I created and use in class to teach students how to create data legends using the different types of measurements. This walks them through how to not only create a data legend for that variable but subsequently how to enter that data correctly from their coding sheet into their spreadsheet so that the spreadsheet can be analyzed in SPSS or elsewhere. Once you walk students through this process, you can give them an activity to test for understanding and application. If the students don’t enter their data correctly now, it is going to be a mess when they try to import it into SPSS. So while this may take some valuable class time or may serve as homework, I recommend assigning the data entry and data legend activity (see below) and making sure the students entered their data correctly. In the activity, it is important to clarify to students that, in part 2 of the activity, the survey responses are separated by semi-colons such that the first respondent’s answers are: a) digital film, b) freshman, c) 4, and d) Domino’s, Pizza Hut, Pizza Perfection. Once your students got this down, set them loose to do their data entry. You may want to assign that as homework. You can give them a lecture on descriptive statistics and work with SPSS or whatever software you’ll be doing the analysis in. Help the students interpret what the data means by pointing them to their data legend. I hope this blog post was helpful. Again, if you have not yet done so, check out the first article in this post to learn more about the Netflix media placement assignment. If you want to know more about my applied communication research class, you can see all blog posts related to communication research here. Project 1: Media Placement Assignment Handout (from previous blog post cited above). 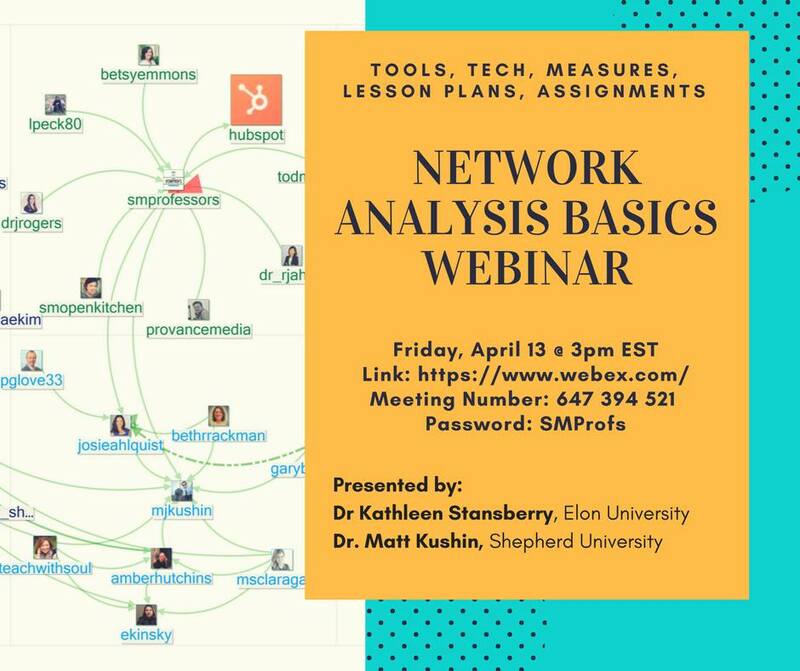 Last Friday, April 13, I had a wonderful opportunity to participate with Kathleen Stansberry on a webinar about social network analysis basics. The focus of the call was to introduce strategic communication and social media professors to social network analysis. The idea for the call came out of a thread on my favorite resource for social media education: the Facebook group Social Media Professors Community Group. (If you’re not a member, I strongly suggest joining! The people are generous, curious, and extremely supportive). A member asked if anyone had insights on reading NodeXL network maps and the video conference call sprang from that. Dr. Stansberry has some really impressive experience with social network analysis. As someone who considers himself a fan with much to learn, it was an honor to be invited to be on the call as a co-presenter with her. I shared my knowledge of social network analysis basics and provided an assignment I teach in my Comm 435 Communication Research class. In that class, students use Netlytic.org, which is an accessible online social network analysis tool (See my blog post about the Netlytic assignment). I learned a ton from Dr. Stansberry and was inspired to dig deeper into social network analysis so that I can bring my knowledge up and do more with this fascinating method! If you missed the live webinar, you can watch a rebroadcast of it anytime in full [you may need to download a plugin]. Below, you can find the handout and assignment that I shared during the call and the slides I shared on the handout. Thank you again to Dr. Stansberry for inviting me to participate! And a big thank you to Karen Freberg and the Social Media Professors group for hosting this call! In my opening post to the Spring 2018 semester, I reviewed several new assignments and activities I will be bringing into my classes this semester. In this post, I will discuss the quantitative content analysis assignment that students will complete in my COMM 435 Communication Research course. The project simulates an analysis of earned media placement. update – 12/3/18: To see a follow up post to this post, check out Communication Research Class Media Placement Assignment, Part 2: Doing Data Entry and Creating a Data Legend. [Here are all the posts about that class, including discussion of past projects]. My aim with the communication research class is to offer our students experience learning about a variety of approaches to conducting research. My goal is to mix methodology (i.e., the study of research methods) with practical applications that students may run into in their careers. This course is not a graduate school prep course. It is designed for students who are planning to go into industry. I think a struggle that many of us have is that there is a sense that we need to prepare students to be able to do the “new and cool stuff” (e.g., social media data analysis) in the research class, while balancing educating students about the research process, research ethics, designing measurements, building methods, gathering data, analyzing data, interpreting data, etc. Unfortunately, we only have this one research class in our department as we are a small department serving a wide array of needs. I know that some other universities have advanced research or analytics courses. Thus, for me, I need to fit in both emerging methods and what some might see as traditional, evergreen methods: content analysis, surveys, focus groups, interviews. Each project is done in teams. This blog post will focus on project 1, content analysis of media artifacts. As an side, if you’re interested in learning about the social data analysis assignment, last year I wrote a 4-part series on that assignment that I’ve gotten a lot of comments and questions about. Learning research methods is a challenge for anyone new to it. Undergraduates sometimes express a strong aversion to the topic. I’ve found that a content analysis of media artifacts is the most approachable method for introducing students to the systematic nature of doing research. During the first few weeks of class, students are learning about research (e.g., the process, concepts such as reliability & generalizability, what research methods are, sampling, etc.). After that, I introduce a hypothetical situation that the students will have to solve for their first project. Each year, I change up the situation a little bit. But the nuts and bolts have remained the same for the last 3 years. I use the format from the Stacks book to set up the hypothetical situation students will address. You can see the entire text for the situation in the assignment at the bottom of this post. I will be referring to it in the paragraphs below. The hypothetical is that the students work for an agency representing Netflix. Netflix is facing greater competition from other online streaming services like Amazon. To keep its competitive edge, Netflix is working to create shows that will appeal to a key market: 30-somethings. Stranger Things is one such show. Season 2 just launched. Because the success of Netflix shows is widely influenced by critical acclaim from media, a media relations campaign was undertaken to position Netflix positively relative to itself competitors as a streaming service by way of the show. The objectives of the campaign were to gain positive coverage of the premiere of season 2 of Stranger things. The students enter the situation after the campaign has been executed and the campaign is now in the evaluation stage. Their job is to evaluate whether the media coverage was earned and what the nature of that coverage was. I used to gather a sample of news articles from LexisNexis and provide them to the students. This semester, the students will gather the data set themselves using the Meltwater social intelligence software. I’m excited about this because it gets the students into Meltwater and thinking about the use of the tool’s dashboard features. In addition, students are learning that they have the ability to pull down data for further analysis outside of Meltwater. The Meltwater software enables users to gather news articles from a given time period. Searches are conducted using keywords. Stranger things season 2 launched October 27, 2017. So the data set is built around the season premiere. I don’t have a strong research justification for the exact date range chosen. Rather, I chose it because it produced a manageable number of articles for each student to have to code. Also, please note that I do not operationalize what “top news sources” are from the assignment objectives. Instead, for purposes of the exercise, I have students pick the top 5 sources related to their search results to analyze. You can see the procedure for gathering the data via the Meltwater for Media Article Content Analysis lab guide I created. There is a lot you could do with Meltwater to analyze the articles related to the launch of season 2 of Stranger Things. If I had more time for this project, we’d dig into a lot of the dashboard tools. For now, students are only focusing on the quantitative content analysis of news articles. I provide the students with details about specific research questions they are trying to answer related to media coverage: placement, share of voice, and whether or not the campaign’s 3 key messages made it into the press. The data analysis is a simple quantitative content analysis of media artifacts. A simple coding sheet is provided. We discuss inter-coder reliability. And each student codes his/her media articles by hand using the coding sheet. In class, we go over the coding sheet. And, in addition to the items on the coding sheet, which align with the research questions, students come up with their own item to code and to report in their paper. I do this exercise to get the students thinking about other things they could look for in the articles that might be useful. While some of the coding can be done in class, students finish the coding as homework. You can see the coding sheet that we will use this semester at the bottom of this blog post. The students take their coded data and enter it into a spreadsheet so that we can quickly run frequency reports using SPSS. With project 1, the write up that students produce is limited to providing a problem overview, the results, and a brief discussion section along with an appendix of their coding sheet. In the second and third projects students are asked to produce more and more of what a research paper might look like. But, because this is not an academic research class, I try to balance introducing students to a more academic style of research writing with a style that is more suitable to a report they might right in industry. I use a similar format to the format presented in the Stacks book. I provide students with several handouts to help them write up their results. One opportunity this assignment always presents, is a discussion about the limitations “simply measuring” the items on the coding sheet without looking at any context. As such, students are to go into their data and identify the features of the articles that support their results. Thus, they find example headlines and quotes to demonstrate, say, an example of a key message that was amplified. This project is, of course, limited in several rather important respects. However, I’ve created this project because it provides a great opportunity to introduce students to research, what a content analysis is, how to use a coding sheet, inter-coder reliability (invariably there are disagreements into how aspects of articles should be coded), and more. Further, the project presents these learning opportunities within the context of learning a little bit about how one might evaluate earned media coverage. For example, students have learned about key messages in other classes. Now, they are learning about how those key messages may make their way into media articles and how the media represents them. The project accomplishes this while situating the assignment in a campaign that is hypothetical but that is based on real events: Stranger Things Season 2 is real. Many of my students love the show and have watched it. They are reading real media articles about the show. Further, students are situating this project as a campaign evaluation because the entire project is situated within the narrative that the students already executed the campaign and now they are evaluating it. Each year I have changed up the Netflix show that we analyze and have thus changed the hypothetical backstory that accompanies it. The key messages on the coding sheets are messages that I made up. They do not change much year to year, other than to bring them into the context of the show we’re evaluating. For example, this year I changed key message number two to emphasize the theme of nostalgia, which relates to the 30-something audience we are trying to target. I write the messages to be purposefully broad enough that they always end up achieving a good amount of frequency in the data set. The key messages are based on my general knowledge of Netflix. This year, it is possible that we won’t get many hits on key message number two. But, we’re bound to have some success with all three. However, if you choose to do this project and have some time, a better way to write the key messages would be to read through the data set ahead of time and develop them based on your own content analysis of the articles. The next step is to teach students how to do data entry into a spreadsheet and to create a data legend. Read the follow up post in which I explain how to do this. I hope that you found this blog post interesting and helpful. If you have ideas on how I can improve this project, please leave a comment or Tweet me. If you decide to use a version of this project in your own class, please stop on back and let readers know how it went or ways that you built upon it. Don’t forget to check out the assignment below and the accompanying coding sheet. Note: The hypothetical situation above uses the names of a real brand, Netflix, and its product. However, the situation is entirely made up and exists for educational purposes. Netflix logo is copyright Netflix. I hope that everyone had a relaxing and rejuvenation winter break. I’m going to kick off Spring 2018 with something I like to do on this blog at the start of the semester: Offer a preview of some of the changes and updates I’m making to my classes (Here are all past “What’s Changing” blog posts). Some of the things I will share below are items that I have blogged about recently. However, most of these items are new topics that I I hope to expand upon with blog posts during the course of the semester. The public relations class is the first class in the Strategic Communication concentration. In short, this is where students are introduced to the field of study. I will be working to provide a greater emphasis on personal branding in this class, as I discussed in a recent blog post about an online personal branding assignment. My hope is to, therefore, start the personal branding conversation as early as possible. As a result, I hope to be able to continue to emphasize it and expand upon it as students work their way up through the concentration. I am planning to continue with Ketchum’s Mindfire program and with the Cision software certification. See all past posts about my COMM 321 Public Relations Principles class. I teach this class once a year during the spring. Each semester, I have made modifications to the class. But, at this core, this class aims to prepare students to conduct applied research using both new (e.g., analyzing social data) and traditional research techniques (e.g., content analysis, surveys, focus groups and interviews). We touch on both qualitative and quantitative approaches. Students complete 3 projects, each aimed at addressing a different hypothetical situation that they may face in their careers. For the past few years, the first project in this class has been a basic quantitative content analysis of media artifacts assignment. I find that teaching content analysis first is a good way to get students warmed up to conducting research. The content analysis method is used to address the following situation: A media campaign has been run to promote a new Netflix show. The class project begins after the campaign in the evaluation stage. The students need to assess the coverage of news articles to see how effective the campaign was in getting media placement. We look at share of voice, placement within the article, whether our hypothetical key messages made it into the article, etc. In the past, to get the data, I gathered news media artifacts via LexisNexis and distributed them to the students. It was not the most hands on learning experience. This semester, I’m super excited because the students will be using Meltwater social intelligence software to create their own search for articles they will be analyzing. This will enable students to have a data set comprised of both traditional news as well as newer, online publications. Adding this little touch will improve the learning experience, provide a better data set, and make things feel that much more ‘real.’ It’s the seemingly small but powerful improvements like this that make all the difference! A big thank you to @Meltwater and Carol Ann Vance, director of university relations at Meltwater! As frequent readers of this blog know, I had the opportunity to use Meltwater in my COMM 322 Social Media class last semester. I am pumped to bring it into my research class this spring. There has been a lot of discussion about certifications in the social media professor’s Facebook group. Like many of you, I’ve been wanting to get my students to complete certifications that have been created by industry. Students will be given the opportunity to complete the Google Analytics certification this semester in the class. I’m approaching this as a beta test. I’ve been wanting to get my students trained in analytics. However, my class is so packed already that I haven’t dared bring it in. The compromise I’ve decided upon is to let students complete the analytics assignment outside of class on their own in place of the research analysis paper that I traditionally assign in this class. Thus, the decision is entirely optional. And my goal is to assess feedback from these students on how it went. From there, I’ll decide how to approach the certification in the future. The BuzzFeed assignment will continue. But, this semester we’re going to do the BuzzFeed assignment as the first major writing assignment instead of as one of the last assignments. Therefore, I will be shifting the focus of the assignment from spring break to a new topic. Students will need to write about West Virginia, or their home state. I will be removing the Facebook ad writing assignment (and moving it to the social media class next fall). Last year, I had my students write a Facebook ad promoting themselves. The assignment was based on Dennis Yu’s lecture to my class from several years ago and his unique approach to Facebook ads: The $1 a day strategy. The assignment was great. But I’ve decided paid social needs to be covered in the social media class. I’ll be adding how to write for paid search in its place. Students will be learning about paid search using the Mimic Intro simulator. Paid has become increasingly important. And I’m finding that many employers are seeking students who have knowledge of paid. I’m interested to see how the software simulator goes, as I’ve never done something like this before in one of my classes. To keep up with my push to increase the certification opportunities in my classes, students in my writing class will now complete 1 of the Hubspot Academy certifications. They’ll have the choice of completing the email marketing or the content marketing certifications. Students can get extra credit for completing both. (I wrote about my experience with the Hubspot Academy here). These are the major changes coming to my classes in the spring that I’m excited about. It looks like Spring 2018 will be busy! If you have experience with any of the certifications or activities above, I’d love to hear your input or recommendations. This is post #4 in a four part series about a new assignment that I used this semester in my Communication research class (all posts on that class). That assignment is a 3-part social media analytics project. Each part is related but unique, allowing students to pick up a new skill set. In this post we’ll discuss part 3 of the assignment. If you haven’t read the assignment overview post, and the earlier post about pivot tables in Excel or my other post on this assignment about Microsoft Social Engagement, I encourage you check those out. In the first post, you will see a copy of the assignment that is discussed below. This last part, part 3 of the assignment, asks student teams to do basic network mapping of their client using Netlytic.org. Map of Twitter data I created using Netlytic.org for #CincoDeMayo May 5, 2016. Why Teach the Basics of Social Network Analysis? This semester, I wanted my students to get exposure to, and a basic understanding of, social network analysis. I am not a social network analysis. But it is something I find fascinating. And I think it is important that as professors we have at least a basic knowledge of this field and that our students do as well. I feel this way in part because of the rise of professional tools that social media professionals have for visualizing social media data. While several of the questions that can be culled from the work students did in the portion of the project described below could also be answered through other means – such as Microsoft Social Engagement -, learning about social network analysis and having this experience offers a different and valuable way of understanding who is connected to whom within a network. With the above said, the below-described project provides students a chance to visualize a social network and see how different actors relate to one another around a specific topic on Twitter or Instagram. Students explored the conversation around their client’s Twitter and/or Instagram account to see not only who was talking about their client but the connections among those people talking about their client, who was talking about the client the most, and who was talked about the most. There are many ways to visualize a social network. It can take quite a bit of time to learn the software. 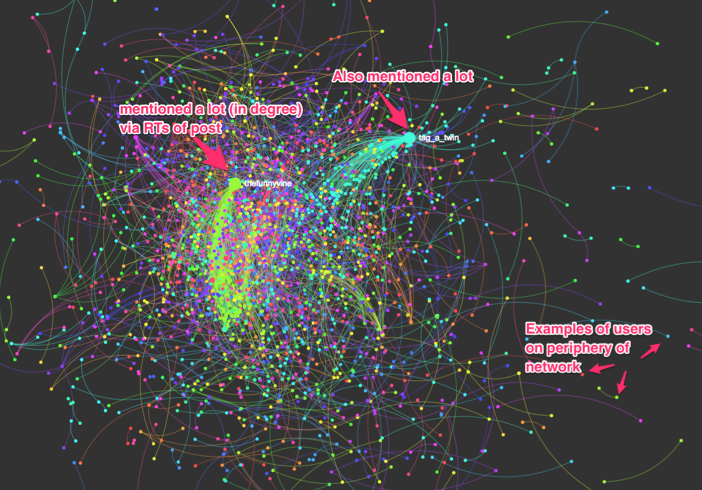 For example, I spent a weekend working on a #hokies network map using Gephi (read that post for a step-by-step guide of how I created a basic Twitter social network visualization). As you can see in that post, there are a lot of steps involved in building that one network map. But the upside is that Gephi is pretty robust and in my weekend working on it, I only scratched the surface. I first began playing with Netlytic soon after realizing that, for the baseline knowledge I want my students to have, I could not afford enough class time during the semester to warrant the investment in time and effort that would be needed to teach students all the steps of getting Twitter data and analyzing it in Gephi. The downside of Netlytic is that is not quite as powerful and the visualizations are not as visually stunning. Despite those limitations, I found Netlytic to have many upsides. For one, it is very easy to use and learn. A basic account is free and Netlytic will pull down the social media data you want directly into its service. From there, you can begin analyzing the data with just a few clicks. I provide resources for learning how to use Netlytic below. Weeks before the we analyzed Netlytic in class, students were to create their own free Netlytic account and program their client’s Instagram or Twitter account and any hashtags they wanted to track on Twitter or Instagram related to their client. The free version of Netlytic only allows an account to track up to 3 different searches at a time. Thus, teams were limited to 3 different networks to map. Each team approached this slightly differently, depending on their client. There are 2 days of the semester dedicated to social network analysis and working with Netlytic. Day 1 is primarily lecture based. I provide a lecture of what social network analysis is, why it is good to have a basic understanding of it, and basic concepts that we’d be exploring. Specifically, I introduced nodes (e.g., Twitter users) and directional and uni-directional edges (the connections between them, such as retweets), talked about degree centrality (e.g., in-degree and out-degree density) as well as reciprocity, centralization, diameter and density. On day 2, we relate these concepts to social media via a 15 minute lecture. For example, we discuss how in-degrees (who is mentioned a lot) and out-degrees (who posts a lot) would relate to Twitter posts. I then show several examples of social network maps of Instagram and Twitter and how concepts discussed in the prior class relate to them. And the rest of class is dedicated to working on analyzing the students’ client network. There is a third day that is dedicated to students finishing up their Netlytic as well as anything they didn’t get done related to their Excel pivot tables and Microsoft Social Engagement. As is the case with the other 2 parts of this assignment, students work in the computer lab on their Netlytic portion of the assignment during class time. I provide a basic lab guide of how to use Netlytic. The great thing is, Netlytic provides a lot of instructions on their YouTube page on how to use the software. This great video shows you how to analyze your network map. It walks you through all of the steps of doing the network analysis and provides a list of resources for further understanding basic social network analysis. Depending on what your networks are, you’ll need to choose from the RQs below. Choose all that are appropriate. Feel free to create your own. Discard the rest. What Twitter accounts are popular in this network and how often is each popular account mentioned? What accounts mention others or RT others a lot in this network? What unique clusters exist in this network? What Twitter accounts mention your client the most? How often does each mention your client? What communities are talking about @USERNAME? This project has three parts to it. Part 1 teaches students about using Excel pivot tables to analyze Twitter data. Part 2 gets them using industry social media analytics software. Part 3 introduces students to social network analysis and mapping a social network. The project takes several weeks of hands-on learning during the semester. For the students, a lot of work goes into the final product. Because there were many moving parts, it was a little difficult at times for students to grasp all of the details of what we were trying to accomplish. Some student groups lost sight of the fact that the data they were dealing with was from different time periods because it was not all collected at the same time (a weakness I discuss in post #1 on this project). One area of weakness was that some of the groups struggled with interpreting what their data meant and offering actionable suggestions to their client on how to enhance their social media based on the data. Next time, I am going to try and tighten the assignment up. For example, I want to slim down a few of the research questions students had to answer that seemed a little redundant across the 3 different parts. I also want to place more emphasis on helping students think about what their results mean and how they can use the knowledge they have discovered through this analysis to make meaningful recommendations for their clients. In summary, this is the first time we’ve run the project, and overall I am pleased with the outcome. I feel that this project helped me further ‘modernize’ my communication research class by placing greater emphasis on getting students working with social media data and thinking about what that data means. I hope you enjoyed this 4-part series on the new social media analytics assignment in my communication research class! If you haven’t yet, be sure to check out post 1, post 2 and post 3. Update: in April 2018 I did a webinar with Dr. Stansberry about social network analysis in which I discussed Netlytic. This is post #3 in a four part series about a new assignment that I’m using this semester in my Communication research class (all posts on that class). That assignment is a 3-part social media analytics project. Each part is related but unique, allowing students to pick up a new skill set. In this post we’ll discuss part 2 of the assignment. If you haven’t read the assignment overview post, and the post about pivot tables in Excel, I encourage you to do so before proceeding. In the first post, you will see a copy of the assignment that is discussed below. Part 2 of the assignment asks student teams to analyze their client and its competitors using Microsoft Social Engagement (sometimes called Microsoft Social Listening). You can learn more about how our communication department is participating in the Microsoft Dynamics Academic Alliance program program in my initial post on Microsoft Social Engagement. Keep in mind that you have to program what you want the software to track ahead of time. It isn’t like a Twitter search where you can go in and look into past 2,500 posts on a topic after the fact. So, we have to program the student team’s clients and 1-3 competitors into Microsoft Social Engagement several weeks before the students sit down to work on the assignment. That way, there is some data for students to analyze. I required students to turn into me the Twitter, and if available Instagram account, for their client and their competitors. I programmed them about a month before we worked on the assignment. To make my life simple, students had to turn all of this in at the same time they turned into me the Excel file of their client’s Twitter data (discussed in the pivot table blog post). In my social media class, students were introduced to Microsoft Social Engagement and were given some guidance on how to use it to complete a metrics tracking spreadsheet. The purpose there was for them to track data week by week. In this class, we went a bit deeper. My purpose here was for students to look at the sum of data over a given period and extract specific insights. I added geolocation (q 3), a look at top engagement across time (q 4), parsing top positive and negative keywords (q 6 & 7), and exploring critics of the brand (q. 8). Taken together, my goal was for students to learn the software in my social media class by throwing them into it. In this class, I wanted them to gain more experience, think a bit deeper and dig a bit deeper into the software. For this part of the assignment, I created specific questions I wanted students to answer (below). To guide them through the steps needed to answer the below questions, I created this lab guide. Students worked through the lab guide in class and I was on hand to assist them. This lab guide is similar to the lab guide I provide my social media class (and which I shared in the original blog post on Microsoft Social Engagement). However, this lab guide is appropriately more thorough. For the client and each competitor, the students were to answer the below questions. For CLIENT’S NAME what is the total number of a) shares, b) replies, and c) posts on Twitter during TIME PERIOD? For each keyword, what is the share of voice for the client and its competitors? In what STATE/COUNTRY were the top posts posted that mention CLIENT? What day(s) of the month was CLIENT talked about the most on each social media platform? Note: if we only have data from Twitter, then just use Twitter. What is the sentiment percentages (positive, negative, neutral) for CLIENT? What are the top positive keywords associated with CLIENT on each social media platform? What are the top negative keywords associated with CLIENT on each social media platform? Who are the top fans and critics for CLIENT on each platform? Of course, the above 8 questions are just a sampling of what you could do with the software. The software can be a bit challenging to use. And I found that students struggled at times to navigate it. It is important to make yourself available in class to help students. Also, because the students had to answer these questions for their client and then for their competitors, it was rather time consuming. Teams that tackled this project in a smart manner, divided up the work and then put their answers together and reviewed them. Some students may feel that this part is somewhat redundant to what they do in Microsoft Excel pivot tables. Questions 1 and 2 from the pivot exercise are similar to questions 1 and 4 from Microsoft Social Engagement, respectively. But, in my point of view, it is different enough and, importantly, it is a different way of analyzing things. Still, because this project overall requires a good deal of work when you consider the pivot tables and the social network mapping ,which we’ll discuss in the next post, you may find it useful to remove some of the above questions. Projects like these can be intimidating and challenging for students. But I truly believe the benefits outweigh the drawbacks. The opportunity for students to learn industry software in the classroom is highly valuable. And it is better for students to dive in while in school than have their first exposure be overwhelming on the job. In the next post, we will discuss part 4 of this assignment which gets students using Netlytic.org to do some basic network mapping of their client’s online network. I will be publishing that post in 2 weeks. Update: You can now read Post #4 on Netlytic. If you haven’t yet, be sure to check out post 1 and post 2 in this series. In my last post, I discussed a new assignment that I’m using this semester in my Communication research class (all posts on that class). That social media analytics project assignment contains 3 parts. Each part is related but unique, allowing students to pick up a new skill set. In this post, post 2 of 4 in the series I’m writing about this assignment, we’ll discuss part 1 of the assignment. If you haven’t read the assignment overview post, I encourage you to do so before proceeding. There you will see a copy of the assignment discussed in the below post. Part 1 of the assignment asks student teams to analyze the Twitter data provided by their clients by creating pivot tables in Microsoft Excel. If you aren’t familiar with pivot tables, they enable you to filter and visualize spreadsheets. This allows you to focus in on specific data points and quickly extract insights from large data sets. I got the inspiration to create this part of the assignment from a very helpful conversation I had with Professor Stefanie Moore at Kent State University. A big thank you to Stefanie for taking the time to chat with me and for providing me with insights to how she teaches analytics. I am really impressed and inspired by what Professor Moore is doing at Kent State. In order to analyze Twitter data using pivot tables in Excel, you need to first download Tweets from Twitter’s analytics (ads) page. If you’ve never done this before, it is really quite easy. The reason we use Twitter is because Twitter enables you to extract a ton of valuable account data from your account in the form of a CSV spreadsheet. But, as an aside, you could analyze just about any data with pivot tables. My students were required to get the Twitter data from a client. Therefore, I created a step-by-step guide that they could provide to the client so that the client could extract the appropriate data and supply it to me. To ensure we had enough data, I instructed the students to ensure that their client was posting at least a few times per week. I asked students to get 6 months of Twitter data if possible. In short, I wanted to ensure that there were at least 50 Tweets from the client in the time period we collected. This number is somewhat arbitrary. And ideally you’d like to have more. But, 50 Tweets is enough to sort and play with. Step 2: A new window will appear. Click “Tweets” from the menu at the top. Then, select the date range (see below). A menu will open. 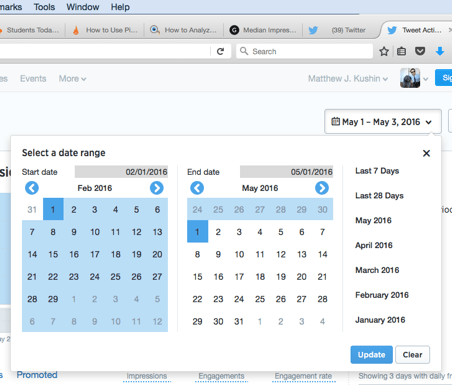 Please select a date range of at least 3 to 6 months back so that there are enough Tweets for the students to analyze. Important: Click “Update” to change the selected date range. In the below example, I selected Feb 1 through May 1 (3 months). Step 3: Once the dates have been selected, click “export data.” A new window will appear. Click “save file” to save the file to your computer. 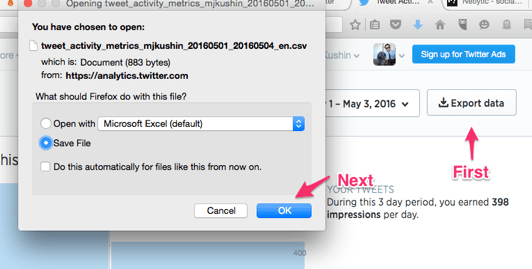 Email that file (it should be a .CSV file named something starting with: “tweet_activity_metrics…”). You have your data. If someone else is downloading the data – such as a class client – , they will need to email the file to you or your student. A few days were set aside in class to work with the pivot tables and learn how to answer the questions students were asked to answer in the project. On day 1, I provided a brief lecture (about 10 minutes). And then I instructed students to begin working with the lab guide I had created. If you’re a longtime reader of this blog, you know I am big on creating lab guides to assist students in learning software. Which Twitter posts received the most (Fill in the blank – you need to decide what variables are important engagement data for your client. You’ll need more than 1 variable. And, you’ll want to show more than just the top Tweet for that variable, but the top few)? 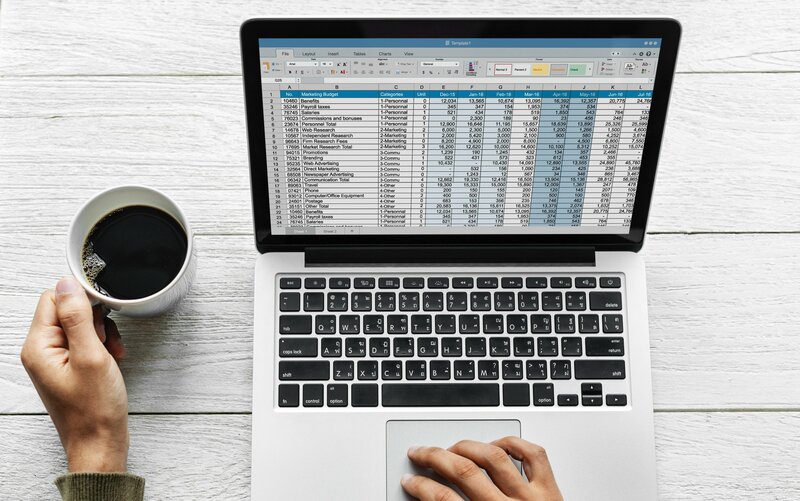 Come up with 1 other RQs for important data points you extract from your pivot table analysis that you believe will be of value to your client. For the above questions, students needed to pick what engagement metrics they wanted to analyze. 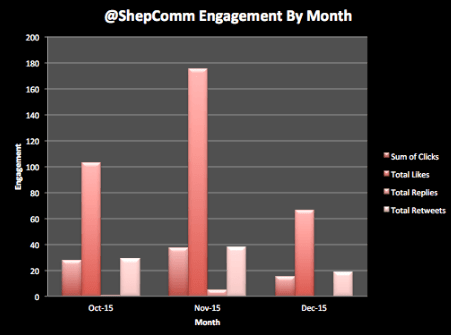 There are several engagement metrics in the CSV file when you download it from Twitter. Examples include retweets and favorites. For research question #3, most groups analyzed engagement by Tweet category. As you’ll see in the lab guide, students learned how to comb through their Tweets and identify common themes by which to categorize their Tweets. Examples may include promotional Tweets, humorous Tweets, Tweets that ask a question, etc. The above 3 research questions are just a sampling of what you could do with the pivot tables. In the next post, we will discuss part 2 of this assignment which gets students using Microsoft Social Engagement to answer some research questions about their client. I will be publishing that post in 2 weeks. In the meantime, if you want to get your feet wet, I encourage you to download your own Twitter data and walk through the lab guide above. 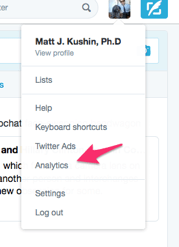 Or, check out some of the sources listed below to learn how to analyze Twitter data with pivot tables. As you will see when you take a look at the lab guide, you must first clean the data so that Excel can analyze it. I then walk you through a number of different ways you can analyze your Twitter data. The fact is that I was a bit of a newbie to pivot tables when I created this assignment. To build the above-discussed lab guide I provided students to help them through learning how to use pivot tables, I relied heavily on several key resources. Much of what is in the lab guide is built directly on what I learned from these sources. To learn directly from the sources I learned from, check out the sources below. A big thank you to all of them for sharing their knowledge publicly. I hope I was able to honor them in adapting their work for a classroom assignment. Update: You can now read the follow up posts to this blog series. A few months ago I wrote about how students in my social media class were using Microsoft Social Engagement to track metrics and do some social listening. At the time, I said I’d follow up with a post about how we were using the software in my communication research class. Well, the time has come! But, this post will do more than dive into how we are using Microsoft Engagement in my class. It will share with you a whole new project my research students are doing. This is post #1 in a 4 part series on a new assignment my students are working on in my communication research class. The assignment spreads over several weeks with a good amount of time in class working in the computer lab. The project is the result of continued and ongoing efforts I’ve been making in a few classes to enhance student education in social media analytics. The project replaces the sentiment analysis assignment I wrote about a few years ago. This post will cover an overview of the assignment (A copy of the assignment is below). Post #2 will discuss using pivot tables to analyze Twitter data. Post #3 will discuss Microsoft Social Engagement. Post #4 will discuss Netlyitic. Update: Post #2 on pivot tables is now available, as is Post #3 on MS Engagement and Post #4 on Netlytic. First, let me provide some context. In my communication research class (see all posts related to the class), students work in teams to complete 3 projects. Each project gets progressively more difficult. The project we are going to discuss today is project #2. The purpose of the assignment is for students to get experience performing a social media analytics audit of a client using a variety of social media analytics and social network analysis tools. The goal is for the students to try and understand their client’s current use of social media and provide insights and recommendations for enhancing that client’s social media presence. Each team was tasked with going out and finding a client that would agree to participate. While I had hoped that most groups would approach local businesses, they tended to focus more on on-campus groups like athletic teams. This may have been a result of convenience because each team had to acquire several months worth of Twitter data from their client. I will explain that in further detail when we discuss pivot tables in post #2. So students tended to go to on campus organizations where they already knew who ran the Twitter account. Students use Pivot Tables to explore your client’s posts on social media and analyze their overall engagement. For example, students determine the top posts by their client which made that have gotten the most likes. Students use Microsoft Social Engagement to monitor and analyze the conversation surrounding the client’s brand. Students use Netlytic.com to build visual representations of their client’s social network on Twitter or Instagram and do some basic analysis. For each component, I have created a set of research questions that students answer using the appropriate software. The students adapt the research questions a bit to their context when necessary. You can see the research questions in the assignment below. On day 1, I provide a 10 minute lecture on pivot tables. The rest of the class is a lab for students to work on learning how to create pivot tables to analyze Twitter data and answer the RQs. On day 2, I give a 20 minute lecture about the social engagement software and talk a little about sentiment analysis so students understand what it is when they look at it in the Microsoft software. Day 3 is a lab day to work on whatever they weren’t able to get done in the pivot tables or the social engagement software. On day 4, I lecture about social network analysis and some basic concepts. (We cover some other material this day about writing research papers). On day 5, we finish talking about social network analysis – about 15 minutes – and the students analyze their client’s data. After students complete all 3 parts of the project, they then have to write up their study. The research paper format I use in this class is inspired by Don Stacks book, Primer in Public Relations Research. In the past, by the second project students are writing brief literature reviews. However, because this is the first time I’ve run this project and it has been a lot of work, I called an audible and removed the requirement for the lit review in this project. So, you will see in the assignment below that those requirements have been withheld. Thus, by the second project students have been taught about writing research problem overviews (problem statement, campaign goals & objectives, research objective & RQs/hypotheses), methods, results and discussion sections. The students write up their reports. And they are encouraged to share them with their client. There are a few drawbacks I’ve experienced thus far with this project. First, there is a lot of info coming at the students with this project. The assignment sheet itself is several pages long. As such, it is important to explain things several times and work with the students as they are doing this project. Students need to be responsible for getting the data for this project from their client, creating their own Netlytic account and setting it up to collect data. And, they need to provide me with who their client is and some competitors of the client far enough in advance that I can program it into Microsoft Social Engagement (I’ll go into more depth on this in the individual posts about each section). We had a few groups that made mistakes along the way and were short on data or had to do some last minute scrambling. The data collection periods across the Twitter CSV file, the Microsoft Social Engagement and the Netlytic are not consistent. This is simply a result of the classroom setting and a lack of full control over when data collection happens. For example, a team’s client may have sent their Twitter data which covers the last 6 months one day, a teammate set up Netlytic to collect data another day, and the day I set up the Microsoft Social Engagement to collect data on their client on a third day. With these another limitations in mind, the project has been fun thus far this semester. A major benefit of this assignment is that most of the tools used in this assignment are free or inexpensive and not too difficult to learn (and thus teach your students). Over the next few posts, I will offer some depth on each section of the project. So check back soon! For now, you can get a copy of the assignment below. In my last post, I wrote about a Comm Research project where students use iPads for survey data collection.This is my favorite of the 3 projects we do in my Communication Research Class (see all posts on Comm 435; see syllabus). This week, I want to follow up by discussing how to program the surveys to work on the iPads. I’ll talk through how I teach all of this in class and through activities. Lastly, I’ll explain how I prepare the data for use in SPSS. Programming surveys to work on ONA.io – the free, open-source tool used by my class and researchers around the world – is a little tricky. It follows XLS formatting. Once you get the hang of it, it is super easy. And it is quick to teach and learn. 3) A likert-style question. Ex: How much they like binge-watching on Netflix. In sum, they practice creating an integer, select_multiple, and select_one question. Once students get the hang of it, they log into an ONA.io account I create for the class. Next, they upload their practice survey to test in class using our department’s iPads. But, this could be done on a phone or even a computer itself (Instructions on how to do this are in the lab guide). The #1 thing, is that things have to be done exactly in this formatting. So, little errors like forgetting to put an _ (and putting a space instead) for “list_name” will result in ONA.io kicking the survey back and telling you there is an error. If a mistake is made, no problem. Just fix your form and re-upload. I check to make sure everything is done correctly. This saves time when they program their own surveys. If everything is good, I give students lab time to work on formatting their surveys and help out as needed. After everything has been uploaded successfully – this usually takes time outside of class, so I make it due the following class – students are ready to go out into the field. This is where the fun happens! Students always get great feedback when they use iPads to collect survey data. People tend to be interested in what they’re doing and happy to participate. Some students this year told me that people came up to them around campus and asked if they could participate. That is much different than the usual online survey where we often struggle to get respondents! I can’t express how rewarding it is to see students go out into the field, collect data, and come back having gathered data no one else has before. For most of them, this is their first time doing data collection of any kind. And so while the class is tough and a lot of work, it is rewarding. You can see the ‘aha’ moments the students have when they start drawing inferences from their data. If you only want to look at summaries of responses, you can check that out in ONA.io. But, if you want to analyze the data you’ve got to get it from the way students labeled it to the #s for SPSS. And the participant answers “Vanilla” the data collected would be icecream2. 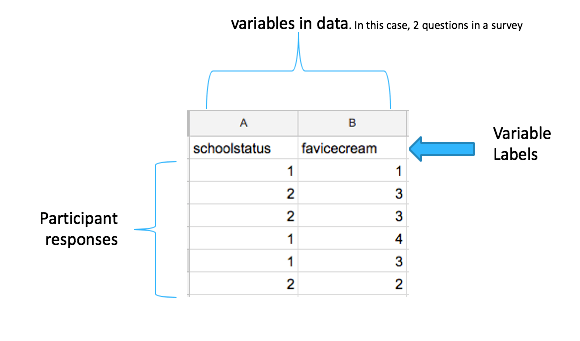 But, SPSS can’t analyze “incecream2.” It can only analyze a number. So, we need every instance when a participant selected Vanilla to be recorded as simply “2” in SPSS. Download the data Excel file of the completed surveys. Open in Excel. Replace “icecream” with “” (that is, with nothing – no spaces. Just leave the replace section blank). Excel will remove “icecream” from the Excel file and you’re left with the number for responses such that “icecream2” now is “2”. Repeat this step for each question. For check all that apply questions, ONA.io records “FALSE” for answer choices left blank, and “TRUE” for instances when the participant checked the answer choice. For example, if the question was “Check all your favorite ice cream flavors” and the participant checked “Vanilla,” ONA would record a “TRUE” and if they left it blank, ONA would record “FALSE.” These can be easily prepared for SPSS by replacing FALSE with “0” and TRUE with “1”. Admittedly, this step is the drawback of using XLS forms. While a little tedious, it is quick and easy to do. Considering the advantages, I don’t mind taking 20 minutes of my time cleaning the data for my students. When done, I send the student teams their data and we work on analyzing them in class. Well that’s all for now! I hope you enjoyed this tutorial and consider using iPads for survey data collection in your research class, or other classes where surveys could prove valuable! Here at Shepherd, finals week starts this week. I hope everyone has a great end to the semester!